You can expect s'mores chocolate tart, mini apple and cheddar pies, gelato, and much more. 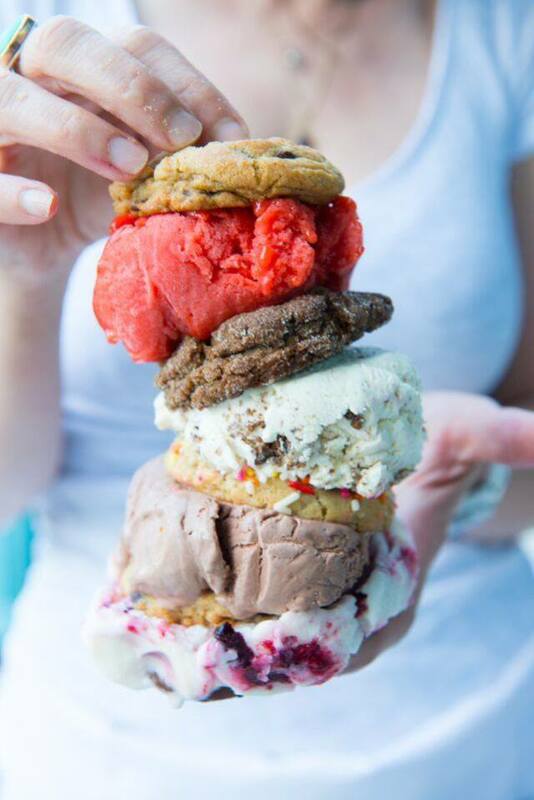 Presumably the ice cream sandwiches at Hello Robin won't be quite this big. But it will contain Pop Rocks. Image via Hello Robin's Facebook page. Seattle's Sweet Week returns for a second year on Monday, September 14 with a host of bakeries, ice creameries, and sweet shops around town offering $5 treats made specifically for the occasion. These $5 tastes are available from September 14 to 20. The Sweet Week website has more information, but here's the full list of chocolate- and caramel-laden offerings grouped by neighborhood. Organic ice cream at its finest: chewy chocolate hazelnut cookie sandwich with butter toffee ice cream rolled in hazelnut toffee. It seems Tom Douglas's commissary baking team wanted to participate in Sweet Week alongside their Dahlia Bakery counterparts. They're making a "City of Seattle" Italian plum and ginger basque cake. The upshot: two $5 sweets in one location. Ice cream sandwich with chocolate chai brownie chunk cookies, Molly Moon’s Stumptown coffee ice cream, and Pop Rocks. Gelato d’autunno is a trio of gelatos using pears, figs and hazelnuts, and served with a caramel cookie. Vegan and gluten-free yeasted cinnamon roll with cream cheese frosting. Trio of mini mini pies, pick three of the following: Beecher's apple pie with local flagship cheddar, apples, and brown sugar cheddar crumble; boozy blackberry with local berries and Schilling Cider’s Mischief Maker, creme fraiche pecan, pumpkin cream, and raspberry chiffon. Flight of fall flavors: pear balsamic ganache, apple cider caramel, and fig fennel ganache. Apple rosette with pistachio ice cream. Smoked chocolate porter ice cream with Hot Cakes’ smoked chocolate. ‘The opera bundt cake’ all-vegan vanilla bundt cake brushed with espresso syrup, covered in dark chocolate ganache, and filled with espresso creme. Cookies-and-cream tuxedo pie with crumbly chocolate-graham cracker crust, layered with rich ribbons of chocolate, crushed Oreos, delicate homemade custard, more crushed Oreos, and whipped cream topping. La vie en rose is sweet rose mousse and raspberry cream in choux pastry. Ballard: Apple cardamom ginger crisp with salty molasses caramel and vanilla ice cream. Capitol Hill: Cherry fig fennel crisp with salted caramel and vanilla soft serve. Blueberry cheesecake ice cream bars. Tea-infused macaron sampler: chai, rooibos, hojicha, and matcha. Mini banana chocolate cake, layers of banana and chocolate cake with sweetened whipped cream and rum roasted bananas, glazed with ganache. Buttered popcorn and caramel crunch cookie with buttered popcorn and peanut crunch ice cream, and Kukuruza Hawaiian sea salted caramel corn.